Welcome to Rolling Acres Neighborhood located in Bentonville, Arkansas! Rolling Acres is a great Bentonville neighborhood with lots of trees, winding streets or rolling acres, and tons of character! The neighborhood has a community pool and playground and the neighborhood has get togethers during various times of the year including a Hayride/bonfire around Halloween with a cake walk and other fun things for both children and adults, Easter egg hunt, pool parties and "ladies night outs"... Rolling Acres is a great neighborhood located in Bentonville, Arkansas where the spirit of community is active and the neighbors actually 'interact". I have had the opportunity of selling most of the homes in Rolling Acres (my husband & I, that is). We have worked with the builders in Rolling Acres since we moved here ourselves in 2006. The homes are not the typical "cookie cutter home" that you tend to see in many neighborhoods throughout Northwest Arkansas. 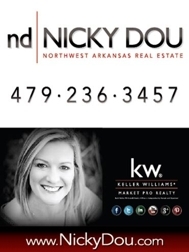 The Best Real Estate Company in Northwest Arkansas!